My coverage of the kind of oak British brewing used for casks in the 1900s, see an example here, has been extensive, yet the war years 1939-1945 were missing. This discussion fills that gap, from a 1946 Brewers Journal. See p. 910 but also pp. 172, 311, 875, and 915. The view was clear: the traditional dislike for American oak continued. The problem was the “tang” or “taint” the wood imparted to beer. Earlier articles describe it as tasting vanillin or “cocoanut”. Think buttery Chardonnay wine, or bourbon whiskey. But war exigencies required use of this wood. The traditional Russian Memel oak, more neutral on the beer and easier to work in the shop, had not been available since at least 1939. 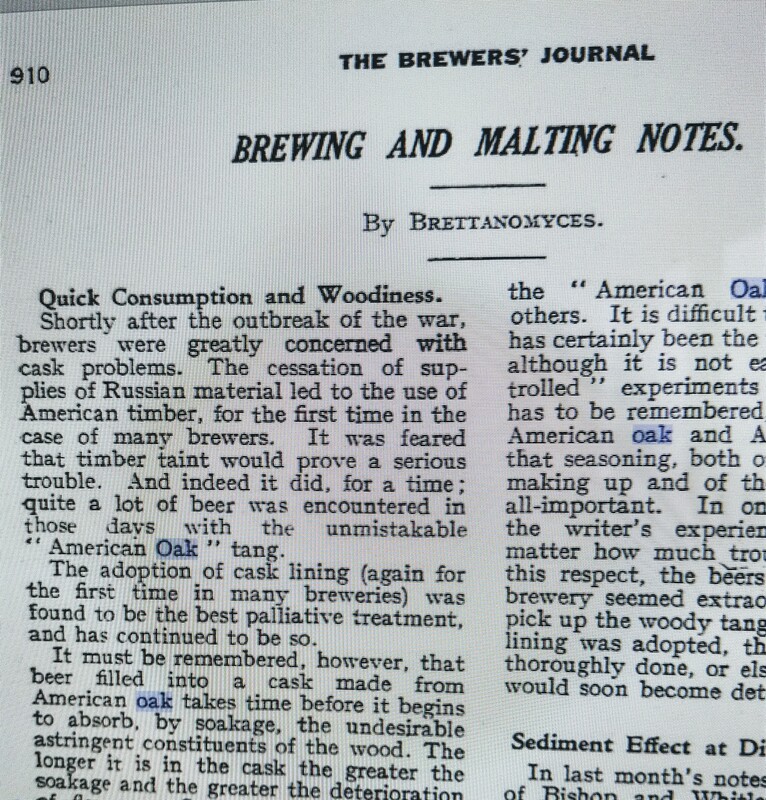 So British brewers did use American wood for barrels but if possible lined them with enamel to counter the ill effects. The writer, the charmingly pseudonymous “Brettanomyces”, also states that with beer short in the war, the ill taste may not have been noticed even where unlined barrels were used. First, the pubs needed the beer so fast the ale would stay in barrel hardly more than a day: this was not enough time for the taint to develop. Second, people simply took what they could get. It was not like before the war when a pint with that taste would be promptly returned by the drinker. With the prospect of normal business conditions resuming the cask question had to be addressed. Given the continued absence of Russian wood, what to do? Different solutions were proposed. Laminated casks with a veneer of suitable wood (it could be British oak) on the interior was one answer. Continued use of lined American casks, another. And finally, use of stainless steel. In the result steel and then aluminium became the norm, by the 1960s. It may be that use of metal casks in U.K. brewing was hastened due to this perceived problem with American wood. If Russian Memel wood had been available after WW II British producers of cask-conditioned ale, at least, might have persisted with it rather than give themselves over to metal. An Anglo-Soviet alliance of British beer and Russian oak appears to be the only satisfactory solution. Given today’s fashion for “barrel-aged” beers irony abounds. Most barrel-aged stuff, bourbon barrel or other, sits in barrels made from American oak. Taste is relative to time, place, indeed person. There is no right and wrong here. But it’s another example of the arbitrary nature of taste. And the power of a catchy slogan. N.B. Imagine that in a still war-straitened country, with a looming atomic age to add further worry, a national newspaper would devote space to the right type of wood for beer casks. So important is beer to the British psyche!